With the credit card market being as large as it is, changes are happening all around us. Credit companies are making changes to stay competitive in the market which could end up being beneficial for customers. Simply contacting your credit card company could result in more savings in your pocket than you would think. A survey done by Creditcards.com found that of 952 credit card holders, 8 out of 10 people who inquired or made requests from their credit card company were successful. Let’s examine this survey closer and take a look at several ways simply reaching out to your credit company could be beneficial for you. Are you facing high annual fees on your credit cards? 82% of people in the survey done by Creditcards.com had their fees waived by simply reaching out and asking. The reason for this is due to the high competition amongst credit companies and their need to keep customers happy as to not lose them to the competitors. Of course, this is not the case for all credit companies and depend on each individual situation, but it can’t hurt to try especially if you have strong credit and a solid history of making on-time payments with your credit card. Are you receiving high interest rates on your credit cards? Nearly 70% of those who inquired about lower interest rates were successful. Lower interest rates mean less money coming out of your pocket on outstanding payments. The study reports that only 19% of people requested lower interest rates, however, 13% of those people were successful (69%). Similar to the waivers on annual fees, this is contingent upon each individual situation. Are you wanting a higher limit on your credit card? 89% of people in the survey reported receiving a higher credit limit after contacting their credit company. Why isn’t everyone doing it? The study reports that only 28% of people requested a higher credit limit but of those 28%, 25% were successful (89%). As you can see, credit card companies are a lot more flexible than one would think. It seems so simple yet still not many people ages 18 to 26 have ever reached out to their credit card company (almost 7 out of every 10 millennials reported never having done so). Next time you believe your annual interest rate is too high, want to negotiate a higher credit limit, or feel like a fee isn’t justified, don’t let it go without reaching out to your credit card company first! You never know what could happen by asking. Schedule an appointment with Powercat Financial today to learn all you can about credit, budgeting, student loans, and more! With the semester starting to come to a close and the holiday season right around the corner you may be seeing an increase in credit card advertising. These advertisements may be coming to you almost every week by mail, or maybe you’ve seen one or two different Samuel L Jackson commercials telling you to sign up for his credit card. There are a lot of great long term and short term benefits from using credit, but it’s important to realize the negative costs from using credit as well. Before using credit, make sure these advantages outweigh the disadvantages. Purchase Power and Ease of Purchase: Credit cards are great to have because you don’t have to carry around as much cash. This can reduce the ease of theft. In addition, some credit card companies offer insurance on large purchases. Building a Credit Line– Building credit is not only important when applying for more credit cards, it also impacts the ease of obtaining loans, rental applications, and even some jobs. Having a credit card and using it wisely (making payments on time) will help you build a good credit history. Emergencies- While you should avoid spending outside your budget sometimes emergencies (such as your car breaking down or flood or fire) happen. Having a credit card allows you to make large purchases you may not have the immediate funds for. Blowing your Budget– Credit card companies encourage users to spend money they don’t have. Majority of credit cards don’t make you pay off your entire balance each month, so if you only have $200 credit card companies may let you spend $500. While it seems great at the time and may seem like free money, that remaining balance of $300 accrues high interest. If you are one that pays your bills on time, you deserve some sort of reward. That is exactly what your credit score is for. Basically, your score can tell lenders, credit card companies, landlords, and even employers how much of a credit risk you are to them. So check out what your score means, what goes into making your score, and some tips on how to improve it! What does my number mean? The most used credit score is called your FICO score, which will normally range from 300-850. 750 or Higher: Having a score higher than 750 will put you in the top 20% of all U.S. consumers. This will lead to the lowest interest rate available when applying for loans. 700-749: If you have a score that falls in this category, you are still sitting at above average. Here, you should feel pretty confident when applying for a loan but should know that your score can still be improved. 640-699: With a score in this category, you will find yourself at the national average. This should tell you that you have plenty of room to grow and that you should look for new ways to establish credit. 580-639: Having a score in this category, you find yourself below the national average. With this score, you may or may not be accepted for loans or new credit, and if you are, the interest rate will be often fairly high. 579 or Lower: This is the lowest category. If your score sits below 579, you should definitely look for new ways to establish credit so that you are able to take out necessary loans when that time comes. Debt can be scary, but it is extremely difficult to establish a solid credit score without taking on some amount of debt. Do not be credit invisible and begin to establish a credit history. 35% – Payment History: Your payment history carries the biggest wait of all five factors. It is vital that you make your monthly payments on time so that your score is positively affected. The way you handled money in the past is often the way you’ll handle it in the future. 30% – Amounts Owed: Lenders want to see that you don’t overuse your credit. Often times, you should want to keep 75% of your credit line available at all times to increase your score. 15% – Length of Credit History: Your credit score will take into account the oldest and newest accounts into consideration. The longer you have an account open, the better. Never cancel old accounts, even if you are no longer using them. 10% – Types of Credit: Your score considers a mix of types of credit. This will include credit cards, student loans, mortgages, etc. Make sure you don’t open too many or too few of one type of account. 10% – New Credit: Don’t open multiple new lines of credit in a small amount of time. This could lead to hard inquires that will negatively affect your credit score. Hard inquires occur when lenders or creditors request your credit report to approve you for a loan or credit card. Credit cards are not the culprits; abuse of credit cards is! Shop for loans quickly. If lenders make multiple hard inquires within a two week period, they will only count as one inquiry. Is it time for me to buy a home? This is often a question many students about to graduate ask themselves. But, even if you’re not getting a diploma in May, there are still many factors to consider while preparing to buy or rent a home. Interest Rates Are Low. In the past interest rates for mortgages have been close to 17%. But currently they are staying around 4-6%, which is an advantage for buyers. That is a difference of $33.415.20 for a 30 year mortgage! First Time Homebuyer’s Programs. There are various programs specifically designed for people who have never owned a home. Some of the benefits of these programs include: income-based grants (for qualified candidates), lower down payments, and help with loan approval. For more information on different programs visit http://www.kshousingcorp.org/homebuyer-assistance.aspx or schedule an appointment with Powercat Financial Counseling! (k-state.edu/pfc) Most of the time candidates are only eligible around college age, due to income restrictions. Tax Deductions. If you itemize your taxes, mortgage interest and real estate taxes are deductible. So you’ll only get this benefit if you own a home. When renting a home, you are often asked to sign a one year lease. Compared to buying, where you’ll typically have to be in the home for around 5 years to make your money back. In addition, you could be required to stay in a purchased home for up to 10 years if you opt for a specific first time homebuyer program! If something in a rental home needs repaired, often times it is the landlord’s responsibility. They hold most of the liability. If you were to own a home and, for example, the furnace went out, that would be your responsibility to fix! This can lead to many unhidden costs- that you will not have to pay for if you rent. However, it is important to read the fine print of rental contracts to make sure your landlord does hold the liability. In addition, it could be to your advantage to get Renter’s Insurance to cover some issues your landlord won’t. The housing market is ever changing. When you are paying rent you roughly know what your check to your landlord will be every month. Housing costs can quickly raise or fall. That is not to say your rent price will stay set in stone forever. But many times your monthly rent payment is locked in for a year when you sign a contract. Again, read the fine print to make sure this is the case. Building credit – which you need to get approved for a loan. Better credit will help get you a lower interest rate and save money in the long run. Budgeting – if you are renting or buying, you’ll need to set a budget that includes both your monthly house payment and other expenses. Some other expenses that it is important to keep in mind are: utilities, other debt payments (car, student loans, etc. ), and necessities (food & clothing). Visit www.ksu.edu/pfc to schedule your appointment today! It is never too early to start preparing for your first home purchase! For students trying to build credit, credit cards can be a great option, but some risks come along with them that you need to be aware of. The Credit Card Act of 2009 requires those under 21 to either have proof of income, or an adult cosigner in order to have a credit card. For many college students who have very little income or are under 21, this can leave you with few credit card options. If you have enough income or can get a cosigner, which could be a parent or family member, a student credit card could be a good option for you. Many student credit cards have no annuals fees, have reasonable interest rates, and offer rewards, such as cashback. Some credit card companies will even provide you with your credit score, which can be a great perk if you are trying to build credit. Many credit card companies also have apps for your phone that can help you track your spending and pay your bills. Most student credit cards have interest rates between 11.15% and 21.99%. Another option could be a credit card offered by your bank or credit union. Be aware of the interest rate, late fees, and any other fees for any credit card that you apply for. Always research any credit card that you are thinking about before you apply. If you are not approved for a credit card, or have bad credit, there is another option: you can apply for a secured credit card. A secured credit card is for those who want to build or rebuild their credit. For a secured card, you are required to deposit money into a savings account to be used as collateral if you are late with your payments, and that deposit will then become your credit limit. A secured card works just like a credit card, and you will have monthly payments and be charged interest if you do not pay off your balance. 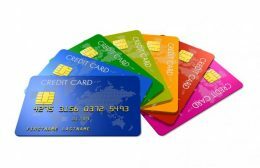 Secured cards usually have an annual fee, and usually do not have the same benefits as many other credit cards. However, secured cards may be the only option to build credit for some. Just remember that if you are not paying your balance in full every month for any credit card, you will be accruing interest, which will add up over time. If possible, pay your balance in full every month to avoid the costs of interest. At least make the minimum monthly payment. Always pay on time. Late payments stay on your credit report and score for 7 years. Never exceed your credit limit and try to stay between 1-30% of your limit. Always read all terms and conditions before you apply for a credit card.